If only the Prousty one had had his right paw up in the air…..
Proust in particular makes a fine lemur. We once had a cat, a large b & w Victorian, whose “tuxedo” coloration pattern caused him to resemble MP, in an 1892 portrait by Jacques-Emile Blanche, with a cravat. He became Prince Marcel (RIP). Lemurs are creatures of supreme majesty, we especially fancy these great leapers. Et voilà. Marcel, only slightly less pretty than a lemur. Well, AJP, I’ve rooted this out of the cellars of the Musee d’Orsay and tried twice to post it here, but it vanishes. Perhaps a case for the Pink Panther. At any rate perhaps the third time will be the charm for this Marcel with cravat — and if not, oh well, he’s beginning to look a little less Lemurian each time round. It doesn’t look like anyone I know. It might have helped with a moustache. To me they all look like Stalin or one of his executioners. These lemurs are not warm fuzzy creatures. They sit in the judgment seat and their wrath is fearsome. I can easily imagine them condemning Joseph K. or Georg Bendemann. Each of us has been condemned by a lemur. We simply aren’t aware of it yet. Consider this a lemur demur, hat. I recommend everybody take a look at Tom’s leapers. We should change the Christmas carol: …..ten lemurs leaping…. Dog is in the details. Tom, the best comments often get labelled as “spam” by wordpress. I can’t find out why it happens and they don’t let me know when it does, so I only find out when I rummage around in the virtual back room. He looks less ill in the portrait. He’s less disagreeable too. Strangely, there are no black rings under the eyes, yet he’s still lemuresque. I like the orchid boutonnière. According to Wikipedia, the Primate of all Spain was announced, in 1088, by papal bull. The postcard print I have has yellowed somewhat over the centuries so that he appears a bit jaundiced, but as his lovely delicate orchid has aged similarly, it seems everything is relative… ly jaundiced. 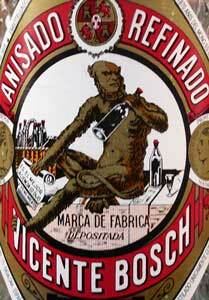 That anisette primate looks a bit Pan-icky to me. As if about ready to spring into a low limb upon issuance of the bull, perhaps. 1088 and all that. On the Twelfth Day the King of England shall be the Lemur Called Proust. Yes, I thought he looked like Pan without the hooves. Wow. Not many company owners paste their convictions on the side of the bottle like that. I wonder if Darwin as an ape sells more anisette. It must, or he wouldn’t have continued it. It’s an interesting business model, I can see pros and cons. It’s also well-known “The Beatles” as four vultures in the film adaptation of “The Jungle Book” by Disney. In this case it’s in honor of them. HAPPY BIRTHDAY, MR. CROWN !!! Goodness! Thank you very much. Now I’m 57, just like Beethoven when he died. And it’s not just mine, it’s also Frank Lloyd Wright’s, you know. But I don’t mind sharing. I too send you my birthday wishes. Only 57, eh? You’re just getting going! I hope the goats have something nice for you. If the goats didn’t bake you a cake, I hope somebody else did. I’ve just had cake, a rhubarb cake that I baked myself late Saturday night after my father’s recipe. Since this is AJP’s party I’ll go and grab the last piece before my visiting mother-in-law. Thank you! Well done, Trond. I love rhubarb. Bruessel, my daughter brought me breakfast in bed (my wife’s away, with her job) which included a cake she’d baked. She got up at 5 am. Now she’s making an us an apple pie. I’m making mackerel for dinner. AJP, I should have realized earlier that today was your birthday, but maybe I will catch you before bedtime, hoping your day was well spent and wishing you many happy returns. How distracted I was yesterday! It’s a bit late, but ¡¡FELIZ CUMPLEAÑOS!! Thanks. And thanks for the cake; I see from English Wikipedia there’s a Norwegian version of dulce de leche, called Hamar pålegg that I can buy. “It won’t be the same”, was my first thought… My brother brought last month a Russian version of dulce de leche (I don’t remember its name) and it was nothing alike. I was thinking the same thing! Maybe she’s the person who put it on the English Wikipedia version. I’ll try it (I could send you some, but what if you don’t like it?). Congratulations, AJP. Can no longer recall 57 myself, but trust it will prove an excellent year for you. You seem remarkably spry for, dare one say it, an old goat.